The Citizen iDP-3550 has been discontinued. No direct replacement is available. Impact, two-color printing, 3.6 lps, parallel interface. 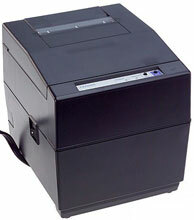 Includes auto-cutter & power supply. Order cables separately. See accessories. Color: Ivory. Dot Matrix Printer, 3", Parallel. Includes Power supply. Color: Black. Dot Matrix Printer, 3", Parallel. Includes Power supply.